A successful merchant, Wadsworth was appointed to a number of commissary-general posts beginning in 1775. He served as the commissary-general of the Continental Army, 1778-79, during which time Washington wrote that, thanks to Wadsworth, "supplies had been good and ample." At the request of Rochambeau, Wadsworth served as commissary-general for the French troops until the close of the war. After the war, Wadsworth helped found, or was a director of, organizations such as the Bank of North America in Philadelphia, the United States Bank, and the Bank of New York. Jeremiah Wadsworth (1743-1804). Army officer; Member of the U.S. House of Representatives; Business executive. A successful merchant, Wadsworth was appointed to a number of commissary-general posts beginning in 1775. He served as the commissary-general of the Continental Army, 1778-79, during which time Washington wrote that, thanks to Wadsworth, "supplies had been good and ample." At the request of Rochambeau, Wadsworth served as commissary-general for the French troops until the close of the war. After the war, Wadsworth helped found, or was a director of, organizations such as the Bank of North America in Philadelphia, the United States Bank, and the Bank of New York. Document Signed. May 6, 1794. 1 page. 6 1/4" x 2 1/2". Check payable in the amount of $192.36. Accomplished by Wadsworth and signed by him as maker. Usual bank cut cancellation, all paper intact. JERIMIAH WADSWORTH. Army officer; Member of the U.S. House of Representatives; Business executive. A successful merchant, Wadsworth was appointed to a number of commissary-general posts beginning in 1775. He served as the commissary-general of the Continental Army, 1778-79. Document signed. 1 page. New York, August 23, 1793. 6 ½ " x 3". Partly-printed bank check, payable to A. B. in the amount of $56.50. Accomplished in his hand and signed by Wadsworth as maker. Usual bank cut cancellation slightly affecting Wadsworth's signature. A nice example of this underrated revolutionary war figure. Very Fine. Manuscript Document. One page,8 ¼” x 8 ½”. Hartford. September 13, 1777. 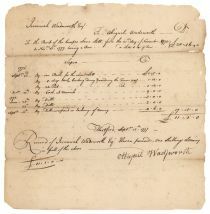 The document is an account and receipt from Abigail Wadsworth against Jeremiah Wasdworth for the rental of a lot and the work performed on said lot. JEREMIAH WADSWORTH (1743-1804) was an American sea captain, merchant and statesman from Connecticut. In addition to the key role in played in the supply the Continental Army during the Revolution, Wadsworth also represented Connecticut in both the Continental Congress and the U.S. House of Representatives. Separation at folds. Else Very Fine.